In the weeks between March and April this year, hundreds of thousands of Armenians occupied the streets and public squares of the capital Yerevan and other major cities of the country, in massive acts of civil disobedience that eventually led to the resignation of then President Serzh Sargsyan. While the protests were triggered by Sargsyan’s attempt to fraudulently extend his power beyond the 10 years he had already ruled Armenia, the 2018 “Velvet Revolution” was driven by economic and social grievances in a European country where 30 percent of the population live below the poverty line. The revolution led to Sargsyan’s resignation on April 23, the day before the anniversary of the 1915 Armenian Genocide. 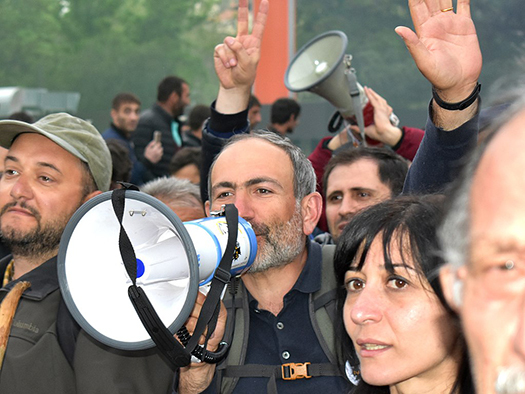 After continued protests outside parliament, the HKK-dominated legislative body—dominated by the former ruling “Republic Party of Armenia” or “HKK” (Hayastani Hanrapetakan Kusaktsutyun) —eventually elected Nikol Pashinyan, an opposition parliamentarian, former journalist, and former political detainee, as Prime Minister. To mark the 100th day since Pashinyan’s election, the new government held a rally on August 17, attended by over 100,000 Armenians. In the days before the rally, Pashinyan’s government, using a civilian intelligence agency headed by a Pashinyan appointee, filed criminal cases against two former presidents and 13 other former officials or relatives identified with the HKK and its network of post-Soviet oligarchs. The charges ranged from “overthrowing the constitutional order,” referring to actions that led to the killing of anti-election fraud protesters in 2008, to charges of embezzlement, unlawful enrichment, and interference in the administration of justice. However, a number of former officials, including ex-President Sargsyan, remain at large or free. Thus, some of the most anticipated parts of Pashinyan’s speech at the rally involved what he would do to pursue accountability and address the continued links between judges and the network of former officials and powerful oligarchs of the country. Anna Myriam Roccatello: There were many events that led Prime Minister Pashinyan in his August 17 speech to talk about “the formation of transitional justice bodies.” It is obvious that since 2008 the magnitude of corruption and the increasingly violent repression fed those who demanded accountability in the face of oppression. But expecting the same criminal justice institutions that didn’t act before to act now would be both naïve and risky. When it comes to learning from other countries where we have worked, like Tunisia and Colombia, what would you consider the most important insight coming out of the meeting with the Prime Minister and with non-government organizations? Ruben Carranza​: The discussion of truth-telling mechanisms was particularly relevant. Despite adherence to the South Africa-style truth commission, there is no one-size-fits-all model for truth seeking. But as we discussed, a truth-telling process could send a signal that the government is serious in uncovering corruption and acknowledging human rights violations. It can build the foundation for accountability and sustain it beyond the initial period of euphoria. There was also a discussion of how such processes replenish the political and moral capital needed by a government that takes accountability seriously. Transitional justice doesn’t mean criminal prosecutions are not going to happen or that the recent filing of charges and arrests are ill-advised steps; it means that processes that enlist and engage citizens and recognize victims of repression can support prosecutions and other efforts that can dismantle the power of individuals, families, institutions, or businesses that want to maintain impunity or undermine accountability measures. Anna Myriam: While the revolution was still unfolding, there were those who compared it with the post-Soviet “color revolutions” of the late 90s-2000s. Along with this comparison came the fear that Armenia’s revolution would turn as violent as the Euromaidan protests in Ukraine. But this wasn’t the case. Pashinyan preferred to compare Armenia’s revolution with the earlier, 1989 “Velvet Revolution” in the former Czechoslovakia. Not only is his comparison more accurate; it also acknowledges the similarities between Armenia’s transition and the recent wave of anti-authoritarian, anti-corruption, and economic grievance-driven youth-and social-media-powered movements, from the Arab Spring revolutions in Tunisia and Egypt to the “Sunflower,” “Yellow,” and “Candlelight” protests in Malaysia and South Korea within the last three years. Why would establishing transitional justice processes be a meaningful response to the demands of the revolution? Ruben: Like the Arab Spring, the Armenian revolution wasn’t an event that only occurred between March and April this year. The context could be compared to Tunisia where many say that the revolution that ousted the Ben Ali dictatorship in 2011 began in 2008. In Armenia, successive protests involving both corruption and economic grievances led to repression, on one hand, and a more emboldened civil society on the other. The deaths of 10 people during the 2008 protests against election fraud and the successful “Electric Yerevan” protests in 2015 that stopped a 17 percent increase in the price of electricity, as well as other justice-seeking efforts, led to the 2018 revolution. The grievances of the Armenian movement are inextricably related to each other: Corruption led to both violence and protest, which in turn led to repression. Corruption also allowed for impunity to be bought or sold and the absence of accountability across all segments of Armenian society —from the capture by oligarchs of state institutions to the suspicious deaths of young conscripted soldiers away from combat in the Nagorno-Karabakh border dispute with Azerbaijan. Also, abuses in the procurement of military equipment have been blamed for casualties in 2016 and fueled grievances regarding the system of conscripting soldiers in Armenia. We’ve seen time and time again that transitional justice mechanisms must be designed in a way that responds to how citizens and victims articulate their demands and define justice. In Tunisia for example, a “Truth and Dignity Commission” was established because young Tunisians see employment as a sign of dignity and many victims of repression during the dictatorship are only now able to openly tell the truth about the repression and marginalization they experienced and the social and economic consequences they continue to bear. So for Armenians, it will be important for the government to consult and discuss—particularly with civil society and victims’ families—what forms of justice they need and how the broader socioeconomic consequences of corruption and violence can be addressed. Only then can transitional justice be a direct and meaningful response to the 2018 revolution’s grievances. Those in power may also consider processes that explicitly try to examine the root causes of those violations, as Colombia is trying to do after its 50-year civil war. Anna Myriam: The ongoing investigations and prosecutions rely significantly on an intelligence service that, in the past, was used by the former authoritarian government. While the new government has appointed its own official to head it, there is still a risk that selective and politically tainted, even if unintended, outcomes can happen. Of course, the same thing can be said about the judicial and prosecutorial agencies in Armenia. They are largely composed of the same officials that allowed these institutions to be abused. Beyond the ongoing criminal investigations and prosecutions, what kind of transitional justice measures should be considered in Armenia that can expand initial efforts at institutional reform? Ruben: Because the abuses of the past two decades are systematic and have irrevocably undermined the institutions, Armenia must look to legal and institutional reforms that are far reaching. For example, approaching election fraud as a criminal prosecution issue would do little to radically change the election process. In the end, justice processes will still need to be complemented by the vetting of officials who are in control of agencies that can influence elections: not just election administration institutions, but also local governments. “Snap” parliamentary elections might happen soon, so there is also a question of sequencing and timing institutional reforms such as vetting. There are far too many holdover officials from the old regime still in key positions, including judges and prosecutors. Pashinyan’s political party only has a small number of seats in parliament—which brings us back to why he has had to rely on the previous government’s intelligence service to investigate and arrest officials linked to corruption or other crimes. Armenia must find innovative ways to advance accountability, particularly if trials are stalled, and to counter dependence on the intelligence service as its driver. Another challenge will be prosecuting former officials to the fullest extent while ensuring that prosecutions are not politically motivated. Anna Myriam: Both the government, particularly Pashinyan, and civil society groups such as Transparency International and investigative journalists, agree that the recovery of assets obtained through corruption should be a priority. There are examples such as that of Peru, Tunisia, and the Philippines, in which several parallel transitional justice measures have incorporated both accountability for corruption among high officials and those with ties to them. But these kinds of grievances have not always been dealt with in the transitional justice processes. How should Armenia incorporate emerging approaches? Ruben: As we mentioned to our Armenian interlocutors, the prosecution of former Peruvian dictator Alberto Fujimori for both crimes against humanity and corruption led to Peru’s law confiscating his ill-gotten assets and placing the burden on suspected corrupt officials to prove that frozen assets were acquired lawfully. A similar approach was adopted in the Philippines as well, where the former dictator Ferdinand Marcos’ family resisted the state’s efforts to recover their assets in Switzerland and elsewhere. Nevertheless, the Philippines recovered $680M in Swiss bank deposits from them and is now using one-third of that amount to fund a reparations program for victims of the Marcos dictatorship. Another important model is that of South Africa after the TRC. The TRC process didn’t really deal with corruption, which contributed to a lack of accountability in the transition, as well as the phenomenon of post-apartheid political leaders capturing the state for themselves. One civil society initiative that Armenia can learn from is the unofficial People’s Tribunal on State Capture. It represents an attempt to expose the truth and deepen public understanding of how and where capture and corruption have happened, and how to recover some of the losses. In addition to signaling a break from the past, a process like this can help the country to examine ongoing legacies of inequality in systems that need to be dismantled.